A variety of wooded and open holes. A very good mix of shots makes for a challenging course. Not well marked. Fee; $1/vehicle. Also - a motocross track, ATV trails, and a boat ramp/launch for Lake Grapevine. 2014 redesign. From Hwy 114; Trophy Lake Dr. then left at dead end onto Trophy Club Dr., 1.5 miles to a left on Trophy Park Dr. which dead ends at the park. Fun course with many technical throws and great hiking. Well kept and well marked. High difficulty. Really great course! 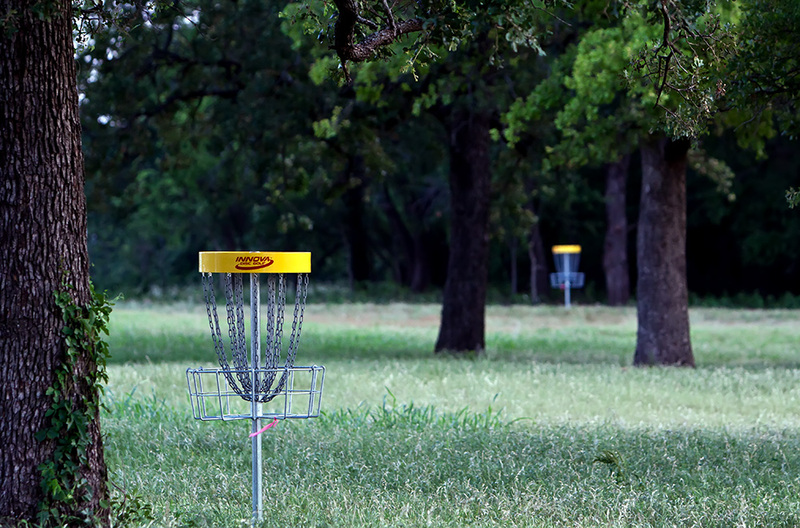 The course has been completely redone since they originally put it in, and now it's one of the best courses in the DFW area! It's easy to follow, maps online and on a kiosk down by the course, as well as paper maps you can get from the guardhouse if someone is working there. It's challenging, but very fun! The back 9 holes are especially hard, they go back through very dense trees. Definitely a great place to play for $1!